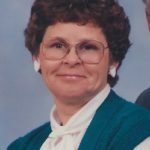 Seaford, VA – Eleanor Jordan Scruggs, 81, passed away peacefully on Saturday, April 6, 2019. Eleanor was a native of Prince Edward County, VA and a Seaford resident since 1964. She was preceded in death by her parents, Manfred and Lula Jordan, and a brother, Joe Jordan. She is survived by her loving husband of 60 years Bill W. Scruggs, Jr. and a daughter, Linda Marie Fletcher (Brian) of Davidson, NC and a son, Edward Mason Scruggs (Lisa) of Myrtle Beach, SC., a sister, Myrna L. McKay (Lloyd) of Farmville, Va and a brother, Benjamin Jordan (Nancy) of Newington, CT and a granddaughter, Dana Marie Hallman. Eleanor shared her love with her husband and best friend of 60 years. She was a devoted mother, grandmother, and friend to many. An active member of Grafton Baptist Church, she worked for many years with the Upward Basketball program. Her high level of energy was only matched by her steadfast desire to give to others. She took notice of the needs of those around her, sharing a word of encouragement, a hug, and always a warm plate of chocolate chip cookies! She was happiest outdoors, and armed with a wheelbarrow, a Coke, and her ballcap, could bring forth an oasis of cheerful color to any yard. She was a former President of the York County Volunteer Rescue Squad, serving as an EMT for more than ten years. She will be fondly remembered responding to the calls of those in need driving her little yellow Volkswagen Beetle, red emergency light flashing. A funeral service will be held at 11:00 AM on Thursday, April 11, 2019 in Grafton Baptist Church. The family will receive friends following the service with a reception in her honor in the church social hall. A graveside service will be held at 11:00 AM on Friday, April 12, 2019 in Trinity Memorial Gardens, Farmville, VA.